We’d love your help. Let us know what’s wrong with this preview of Adeline by Christina McKnight. Everything changed for Jasper Benedict, the Earl of Ailesbury, the night his family died in a tragic fire—the same fire that left him disfigured. Now, his scars have given him the name the Beast of Faversham. But when he stumbles upon a damaged carriage during a tempest, the beautiful woman inside reminds him of the man he wishes he could be: free of his past, and able to love. When her carriage breaks down outside Faversham Abbey, this is just the most recent in a long series of misadventures for Miss Adeline Price. Her beauty hides a fatal flaw: she’s quick to judge, and rarely looks beneath the surface. But the longer she’s around Jasper, the more she begins to want to be better—someone deserving of him. To ask other readers questions about Adeline, please sign up. This is a delightful regency romance with well crafted characters that has elements of Beauty and the Beast entwined throughout but with many twists! The hero is Jason Benedict, the Earl of Ailesbury, who was badly scarred by the fire which killed his parents. He lives in relative isolation, hiding himself from strangers and, despite his endeavours to improve the lot of the people living nearby, he is known locally as the Beast of Faversham. The hero has a damaged outward appearance but has a heart of gold, whilst the heroine appears beautiful outwardly but initially is definitely not inwardly. Their journey to their HEA is emotively portrayed. Adeline is initially a spoilt, brattish, judgemental and feisty young lady, not initially the best of partners for the self depreciating, kind hearted Jason. It is only as she gets to know Jason and the people around him that she realises she needs to change for her to be worthy of his love. Adeline is the third book in the Lady Archer's Creed series by Christina McKnight. I haven't had the opportunity to read the other books prior to this one, but it wasn't necessary in order to enjoy this one. Jasper Benedict is the Earl of Ailesbury. He is terribly scarred after trying to rescue his parents and workers who were caught in a barn fire when he was just 12. Jasper blames himself for not being stronger, not being able to rescue them. He has been treated like a pariah ever since, partly Adeline is the third book in the Lady Archer's Creed series by Christina McKnight. I haven't had the opportunity to read the other books prior to this one, but it wasn't necessary in order to enjoy this one. Jasper Benedict is the Earl of Ailesbury. He is terribly scarred after trying to rescue his parents and workers who were caught in a barn fire when he was just 12. Jasper blames himself for not being stronger, not being able to rescue them. He has been treated like a pariah ever since, partly because of people blaming him for their relatives' deaths, but mostly because they are frightened by him and the supposed monster that he is. He keeps himself to himself as much as possible and has tried to harden himself to the hurt people inflict on him with their reactions. This is such a beautiful beauty and the beast type story, a very emotional one at that. Jasper blaming himself for his parents' deaths is heartbreaking, and the way the villagers treat him is rotten. Such fabulous writing from the author had me near to tears a few times. Adeline is a breath of fresh air and seeing how both she and Jasper helped one another to see life differently was a delight to read. Now that I have read Adeline's story, I want to read all the others in this series because I am sure they will be equally as captivating and enjoyable. Beauty and the Beast is my all-time favorite fairy tale, and this book did a great job blending the traditions of the story with a unique twist and entertaining characters. While the Beast is scarred and Beauty is beautiful, the story was about much more than Beauty taming the Beast. It was about Beauty learning that she is not perfect and she can change to be the person the Beast sees in her. It was about the Beast realizing that he is not confined by his scars but rather his fear of what other Beauty and the Beast is my all-time favorite fairy tale, and this book did a great job blending the traditions of the story with a unique twist and entertaining characters. While the Beast is scarred and Beauty is beautiful, the story was about much more than Beauty taming the Beast. It was about Beauty learning that she is not perfect and she can change to be the person the Beast sees in her. It was about the Beast realizing that he is not confined by his scars but rather his fear of what others will think, and he is loved by many more people than he expects. Miss Adeline Price has been a hoyden all her life. Sent to a girl's boarding school at the age of twelve, she learned manners and deportment, along with more unique skills like archery. Now twenty, she is on her way home after dropping her sisters off at that same boarding school, when a storm causes her carriage to break apart and forces her to venture into the rain in an effort to fix it. Jasper Benedict, the Earl of Ailesbury, is on his way home after a long evening at his gunpowder plant. The last thing he expects to find on a lonely country road is a fine carriage with a lady within, let alone one with such startling beauty. Nevertheless, he offers her his home for the night until she can be safely taken home to London. But while he offers her shelter, he refuses to let her see his deformed body. After all, he is the Beast of Faversham, and she is a Beauty of London, and what beauty could fall in love with a beast? Unlike other reviewers, I never really get the impression of Adeline as a spoiled brat. In the beginning, she is 12, and it is understandable. Even in "present day", she is only 20, and as such has a lot of growing up to do. Although it is implied that she is impetuous and likes to get her own way, no true "brat" would behave so politely toward servants or a terribly scarred man. If she were vain and as selfish as others have called her, there's no way she could change like that over the course of a few days. She does have a tremendous transformation, as she realizes that she needs to improve how she responds to people and see how her innocent words can hurt their feelings. However, changing from a spoiled brat to a young lady with a heart of gold? That's not what happened. As someone who grew up acting very similarly and underwent a change in my early 20s, I will say that this is actually just natural maturation. Sometimes one incident and spark of enlightenment is all it takes for someone to alter their behavior. Jasper was that for Adeline. Jasper, poor man, has no idea what hits him when Adeline comes into his life. But her impetuous nature and love of life is exactly what he needs to break out of his shell and live again. They were perfectly matched! Wonderful story, quick read, and a fairy tale to warm your heart! I eagerly anticipate more books by this author pairing. But when it comes time to reunite Adeline with her family in London, will Jasper believe that she sees not his scars, but the good, honorable man he is? Having now read all of the first three books in this series, I can say without a doubt that they have all been very intriguing. I am now looking forward to the final book in this well written series. All four of these young ladies each deserves her own HEA. I actually thought that Adeline's story would be the last as to me she was the least likely to find a gentleman that could put up with her at times waspish ways. Along comes a man that in most people's opinions wasn't likely to find a woman that would look past his scared countenance to the truly honorable man that he is. Adeline with her many misadventures can not possibly be that woman or will she be? After returning to London and her family after this latest in a long string of misadventures will Adeline still feel the same about Jasper or will she let the opinions of London society sway her? I loved this latest installment in the Lady Archer's Creed series. 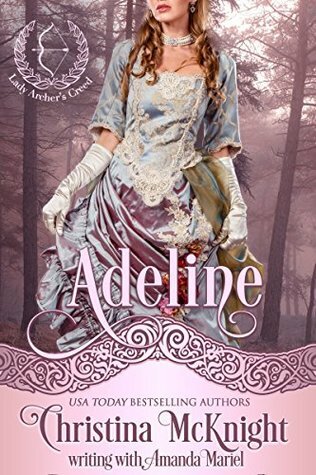 I gave it 4.5 of 5.0 stars for storyline and character development as I believe the character of Adeline improved greatly upon our previous knowledge of her. This is a sweet love story with no more than a few passionate kisses so the sensual rating I gave it is 2.0 of 5.0 flames. Third in the Lady Archer's Creed series, Adeline can absolutely be read as a stand-alone, though I do recommend reading the others in the series (Theodora and Georgina) first. Returning to London after an errand to deliver her younger sisters to the school she herself attended, Adeline is caught in a storm and when her carriage is damaged, forced to accept the offer of hospitality extended by a passing stranger. Jasper Benedict, the Earl of Ailesbury, seems a strange sort - he won't even show hi Third in the Lady Archer's Creed series, Adeline can absolutely be read as a stand-alone, though I do recommend reading the others in the series (Theodora and Georgina) first. Returning to London after an errand to deliver her younger sisters to the school she herself attended, Adeline is caught in a storm and when her carriage is damaged, forced to accept the offer of hospitality extended by a passing stranger. Jasper Benedict, the Earl of Ailesbury, seems a strange sort - he won't even show his face - but needs must, and soon Adeline finds herself safe and warm inside Jasper's beautiful home at Faversham Abbey. Jasper was horribly scarred in the fire that took his parents when he was only a child, and hides away from the world. Adeline is like a breath of fresh air in his household, and he cannot help but be fascinated. When she finally sees his scars and looks past them to see the man inside, he is utterly captivated. Christina McKnight writes in an engaging style, events in the story so absorbing I'm always surprised when I read the end, thinking that the book was too short - but at 239 pages, it's a perfectly reasonable length. Perhaps it's the fact that the entire events of the novel, from Adeline's first meeting with Jasper to the inevitable HEA, take place in the span of less than a week. Which seems like a very short period of time for all the events that occur. Insta-love isn't one of my favourite tropes, and while I thoroughly enjoyed the novel, I think it would have been all the better for some build-up of dramatic tension over time. Four stars. The strong-willed Miss Adeline Price finally meets a man that challenges her to be more than she is. Not much means more to her than her own selfish or driven desires. But when she meets Jasper Benedict, she finds that her feelings about things important to her change. Could it be she has finally met a man that can make her more than she is? Will she realize it before it's too late? Jasper Benedict, the Earl of Ailesbury, and lord of Fabershame Abbey, has lived his whole life remotely, hiding from society so he won't have to face the humiliation of scars he received from a fire that killed his parents and members of his village. The scars, now both emotional and physical, in-prison Jasper. They tie him to the remote estate that has been his family's for five generations. His life's purpose is only to maintain this estate and provide jobs for those families that make up his village. He has no friends and no family- and as he shuns society, no plans of marrying ever. But a carriage accident brings Miss Adeline Price and Jasper Benedict together in the most puzzling of ways. Her carriage breaks down in the middle of nowhere. Rainy and cold conditions send the Earl to her rescue, and she stays at his residence until her carriage can be repaired. Not only does the Earl lose his solitude but with the proximity of Miss Adeline Price, they could lose more than their patience with each other. They could lose their hearts. But since neither ever desired or believe in love, will they even recognize or understand the feelings that propel them to seek out one another before it's too late? Adeline Price, some see as spoiled but I think she is vivacious and very lively, not quite grown up enough yet. Jasper Benedict, Earl of Ailesbury, is a tortured soul. He tried to save his parents, but couldn't and got badly burned himself. I don't think the man has a bad bone in his body. The main characters fall in love, how can she not. The plot is on the line of beauty and the beast but reversed. I enjoyed the best friends she had, Josie, Georgie and Theo, they protected and were loyal to eac Adeline Price, some see as spoiled but I think she is vivacious and very lively, not quite grown up enough yet. Jasper Benedict, Earl of Ailesbury, is a tortured soul. He tried to save his parents, but couldn't and got badly burned himself. I don't think the man has a bad bone in his body. The main characters fall in love, how can she not. The plot is on the line of beauty and the beast but reversed. I enjoyed the best friends she had, Josie, Georgie and Theo, they protected and were loyal to each other, as well. Jasper's servants adored him and he protected and took responsibility for them. The author did an excellent job with this and made it an even paced and easy to read book. It is a clean read, just some kissing and a few feelings. I think most anyone would love this story. I highly recommend it. A reclusive wounded hero finds his soul mate in a somewhat spoiled and independent young lady. I liked the hero, his kindness and compassion to his people and to the heroine. I found the villagers avoidance of “The Beast” an unnecessary cruelty, their fear often stressed but never quite thoroughly explained. Jasper is a tortured soul with physical and emotional scars and a tendency to chastise himself and worrying for things beyond hi "Received an Advance Reader Copy in exchange for a fair review"
I liked the hero, his kindness and compassion to his people and to the heroine. I found the villagers avoidance of “The Beast” an unnecessary cruelty, their fear often stressed but never quite thoroughly explained. Jasper is a tortured soul with physical and emotional scars and a tendency to chastise himself and worrying for things beyond his control. The romance was slow and sweet, with a lot of mundane issues and a bunch of interesting secondary characters. I've read quite a few of Ms. McKnight's books and really enjoy her stories, but this retelling of "Beauty and the Beast" didn't quite capture me the way I had hoped it would. Ms. Adeline Price is a feisty heroine bordering on brattiness who always wants to have her own way. When she is rescued by Jasper, Earl of Ailesbury from a broken down carriage in a terrifying thunderstorm, he takes her back to home. She is further delayed from returning to London by a series of circumstances. During the 1. I've read quite a few of Ms. McKnight's books and really enjoy her stories, but this retelling of "Beauty and the Beast" didn't quite capture me the way I had hoped it would. Ms. Adeline Price is a feisty heroine bordering on brattiness who always wants to have her own way. When she is rescued by Jasper, Earl of Ailesbury from a broken down carriage in a terrifying thunderstorm, he takes her back to home. She is further delayed from returning to London by a series of circumstances. During the 1.5 days she spends with Jasper, she glimpses his kindness and goodness as he takes care of his servants and the people in the village. I loved Jasper as the Beast. Ms. McKnight did an excellent job of showing his compassionate side. The scarred beast of a man has a heart of gold. Adeline, on the other hand, wasn't very likable. Her fiery temper and arguments with her brother makes her unsympathetic to me. Then spending a few more hours in Jasper's company and she's totally in love with him? That seemed unrealistic--in less than 3 days, she's wants to spend the rest of her life with him. I realize this is a retelling of the fairytale, but I wanted more interaction between the two before they both fell deeply in love. And at the end there was a timing issue--was it a month or several months since she last saw him? Both timelines were mentioned and it was confusing. I'm a fan of Ms. McKnight, but this book just didn't speak to me the way some of her other books did. AHHHHH Beauty and The Beast!! This book is totally a retelling of Beauty and The Beast!! So our girl Adeline is a bit of a spoiled brat right?? She pouts a lot ad gets her way a lot with her brother and new sister in law/bestie Theo. When Adeline has to take her 2 youngest sisters to boarding school she has a problem with her carriage. It breaks down in the coldest and rainiest of nights. Adeline sees an imperfect person become the perfect match for her. Jasper learns that he too wants more than just his duty to the villagers. The couple have to learn how to communicate with each other on his lands with his villagers and when they are forced to return to London and deal with the ton. I loved this book. I loooooved seeing Adeline grow as a person in the novel. We see the brat becoming a woman and taking a stand for what she wants. I loved Jasper for his heart. He may act like the shunning doesn’t hurt but he wears his heart on his sleeve. When Adeline is the first woman to look at him as more than a Beast, he is so confused and unsure what to do. The ballroom scene made me have a few tears especially at how bare Adeline lays it all out for her family and friends regarding Jasper. Everything changed for Jasper Benedict, the Earl of Ailesbury, when he was twelve & the stables caught fire leaving him disfigured & also claiming the life of his parents, several servants & some horses. Now, his scars have given him the name the Beast of Faversham. Adeline Price is returning to London after leaving two of her sisters at the boarding school she attended when there is a storm & her carriage is damaged. Luckily for her Jasper passes & offers hospitality whilst the carriage is repaired. I loved this book and actually fell in love with Adaline. Even though I have read all the other books in this series, I never liked Adaline. I felt like she was such a spoiled brat, really selfish and a thorn in her brother's side. Growing up and maturing made her someone I would like to get to know. Who couldn't fall in love with Jasper, the Earl of Ailesbury? After being burnt and disfigured when he was twelve and losing his parents in the same fire he has lived a life of seclusion as the Beast I loved this book and actually fell in love with Adaline. Even though I have read all the other books in this series, I never liked Adaline. I felt like she was such a spoiled brat, really selfish and a thorn in her brother's side. Growing up and maturing made her someone I would like to get to know. Who couldn't fall in love with Jasper, the Earl of Ailesbury? After being burnt and disfigured when he was twelve and losing his parents in the same fire he has lived a life of seclusion as the Beast of Faversham keeping himself covered so no one would see his scares. Until Adaline uncovers who he really is and looks beyond the scares. I absolutely loved this book and the new take on Beauty and the Beast but what I loved more was watching Adaline grow and become the woman who could not only love the beast who wasn't perfect but someone who put someone else first. What a great story. Scarred hero, selfish heroine. The characters are great. They have so much personality and loveable characteristics. The plot and story line are interesting and captivating. The secondary characters where just as well written as the main characters. The author has an amazing ability to grab your attention and not let it go. I've read many of this author's books, but not this particular series. It is well written and the h and H are both lovely, but there really didn't seem to be any real passion. The book is sweet and the romance charming, but not as heated a romance as her other books that I have read. I would consider this a clean romance. I received a free arc in exchange for an honest review. A perfect addition to this wonderful series. A fabulous twist on the classic tale Beauty and The Beast. A beautifuly crafted novel with a perfect blend of supporting characters that accentuate the story. A engaging sweet read with characters that will capture your heart. I cannot wait to read the last book in the series. She shone brightest in the sun, while he was mostly hidden amidst the shadows. Adeline is book three in Christina McKnight’s Lady Archer’s Creed series. It’s a well-written adventure of what happens when a society miss is stranded with a secluded and scarred hero. Miss Adeline is traveling back home to London when a severe storm leaves her stranded along a country road with a broken carriage. Luckily for her, Jasper, Lord Ailesbury, finds Adeline on his way to his country estate. He’s not used to She shone brightest in the sun, while he was mostly hidden amidst the shadows. Miss Adeline is traveling back home to London when a severe storm leaves her stranded along a country road with a broken carriage. Luckily for her, Jasper, Lord Ailesbury, finds Adeline on his way to his country estate. He’s not used to anyone visiting him, least of all a spirited woman such as Adeline. The quicker her carriage is fixed, the quicker she’ll be out of his hair and he can go back to his life alone. But Adeline’s liveliness gets under his skin, and he finds himself wondering if there’s some way she can look past his scars. Jasper really drew me in. He suffered bad burns when he was younger and there’s a lot of guilt wrapped around his heart. It doesn’t help that the townspeople he looks after give him the cold shoulder on top of stares and whispers. It’s no wonder Jasper feels content to be alone. While he’s initially pretty gruff, he also has such a kindness to him. Loyal to a fault. She would show the fool that underestimating a woman, especially Adeline, was something many had lived to regret. Enter Adeline who has this outsiders view of him, and the mysteries surrounding Jasper and his injuries really intrigue her. She’s no simpering miss, and I enjoyed seeing her thrust into this small country village. This is definitely a slow-burn, and clean romance. The plot focuses on these two people as individuals and getting to know their secrets and fears. I like the side characters, too—especially Jasper’s household staff. They were fabulous! But while I thought Adeline and Jasper had a good friendship going on, I wasn’t feeling the romance between them to the degree I was hoping for. There’s was a disconnect happening, and I just wanted to be drawn into them as a couple. As a personal preference too, I like a more hefty dose of sexual tension in my stories. Nevertheless, this series has some loveable characters! There’s a lot of movements in the scenes and enough action to keep the plot barreling the reader along. I’d recommend this book for those readers wanting a sweet and inspiring romance with well-drawn characters. It’s simply a pleasure to read! Adeline by Christina Mcknight was a sweet story but one I have read before, sort of. The story isn't bad, it just introduces you to a snobby young lady who is full of attitude right before she goes to an etiquette school. Then it cut scenes to her as an adult and who has grown-up mature. I just feel like it almost wasn't even worth reading the first part. Now, this is part of a series. So maybe the introduction ties with the previous books of the series, I don't know I have never read them. I gu Adeline by Christina Mcknight was a sweet story but one I have read before, sort of. The story isn't bad, it just introduces you to a snobby young lady who is full of attitude right before she goes to an etiquette school. Then it cut scenes to her as an adult and who has grown-up mature. I just feel like it almost wasn't even worth reading the first part. Now, this is part of a series. So maybe the introduction ties with the previous books of the series, I don't know I have never read them. I guess that kind of threw me off for the first half of the book. This is another retelling of Beauty and the Beast. Books like that are a classic for a reason. So when you read them you have to find what makes that one special. I think part of what makes this so special is how Jasper is. He is almost like a scared little boy who grew to be a man. So everyone around him cares for him, and he equally tries to take care of them. It's really nice. He is horribly scarred from a fire that took his family away from him. You can genuinely feel the love that he has. As the story continues I did start to like Adeline more as a character. She had been discarded by her family. So both characters are lonely and need a someone of their own. For me, it was Adeline's character that sort of lost it for me. Online I see tons of people do love her character, so maybe I wasn't feeling it personally. I would recommend this book so some of my friends, but only if it was something I think they would be into. It doesn't feel like one of those books to me that you have to tell EVERYONE you know. Adeline by Christina McKnight is the third book in Lady Archer's Creed series but despite being part of a series, this book can be read as a standalone story. Adeline is a retake on the classic "Beauty and the Beast" and I just loved reading this book. Adeline is saved from a storm by a Duke who always hide his face and who, the villagers refer to as the "Beast". Scarred by a fire in his childhood, Jasper has lived alone with only a handful of his loyal servants around. But Adeline's arrival turns his lonely existence upside down and he is forced to ask himself if he will take a risk for love. I loved Jasper. He is truly a man with a heart of gold. Courteous, reliable and loyal, he is a woman's dream man. Right from the start, I connected to him and rooted for his happily-ever-after. The author beautifully portrays the difficulty of a scarred man in living a normal life where everyone around him judges him only by his external looks and no one notices the good he is doing for everyone. I wanted to scream and shake the villagers for their indifference and cruelty and loved Adeline for taking a stand. The romance between Adeline and Jasper is sweet, heartfelt and made me smile like a love struck school girl all through. I enjoyed meeting Adeline's two best friends and am eager to read their love stories too which feature in the previous books in this series. The story is fast paced, crisp and engaging. The scenes are vividly sketched and I could easily visualize the booming storm with the creeping darkness around me. The narration is fluid and had me engrossed right till the end. All in all, Adeline by Christina McKnight is a very entertaining romance that is suited for a lazy afternoon. 4 stars out of 5 to it and recommended to all historical romance and beauty and the beast lovers. I received an ARC from the author and the tour organizers via Netgalley and I am very thankful to them. The above is my honest and unbiased opinion and in no way influenced. Adeline by Christina McKnight is #3 in her exhilarating "Lady Archer's Creed". While, it can be read as a stand alone, I'd suggest reading the entire series, but not necessary to enjoy ADELINE. Jasper Benedict, the Earl of Ailesbury, was disfigured in a tragic fire that took his family and left him horribly scarred. Miss Adeline Price, has had many misadventures in her life. Her beauty hides her many flaws, she's arrogant, judgemental, and rarely, if ever, sees behind the surface to the person wi Adeline by Christina McKnight is #3 in her exhilarating "Lady Archer's Creed". While, it can be read as a stand alone, I'd suggest reading the entire series, but not necessary to enjoy ADELINE. Jasper Benedict, the Earl of Ailesbury, was disfigured in a tragic fire that took his family and left him horribly scarred. Miss Adeline Price, has had many misadventures in her life. Her beauty hides her many flaws, she's arrogant, judgemental, and rarely, if ever, sees behind the surface to the person within. Will Adeline be able to see through Jasper's scars to see the honorable and gentle within? I enjoyed watching Jasper bring out Adeline's good qualities, and watch her being concerned over some one beside herself. As she grows into a truly lovable lady, one who finally can see within herself and not like what she sees. Once again, Christina McKnight manages to produce a thought-provoking, heartwarming, compelling and powerful romance. Well written with a cast of characters that are flawed, self-centered, proud but lovable and engaging. The plot flows seamlessly and endearingly. I enjoy Ms. McKnight's writing style, her detail to characters, the Era and the countryside. She never disappoints me or my joy of reading her Regency Romance. A must read for Regency Romance fans. I have read and loved all of Christina McKnight's book, but this one was extra special. The heroine, Adeline, and the hero, Jasper, were beyond wonderful. Adeline has many responsibilities taking care of her younger siblings. Her older brother would like to see her married as they are like oil and water. No man has yet to turn her head or make her heart sing even though she is a beauty. Her inside does not always match her outside. Jasper, scarred from a fire on the outside, has a good heart and I have read and loved all of Christina McKnight's book, but this one was extra special. The heroine, Adeline, and the hero, Jasper, were beyond wonderful. Jasper, scarred from a fire on the outside, has a good heart and is determined to take care of the villagers, often working along side them. He never travels off his land and has no has any family or friends. He is content with his work. A chance meeting due to a violent storm and Adeline's broken carriage changes their life's forever. Jasper makes Adeline's heart sing and helps to bring out her goodness and kindness. Adeline doesn't see Jasper's scars, only his strength and the goodness of his heart. Their relationship from the beginning to the end made my heart ache and tears well up in my eyes. Jasper is one magnificent hero who truly deserved every happiness. I adored him! Ms. McKnight has given us two characters that will stay with you for some time. While this book is third in a series, it can easily be read as a standalone. If you have not read the first two, I would encourage you to do so. They are equally as charming. I have loved the Lady Archer's Creed series and this 3rd book is no exception. This book is a great addition to the series. Of the 4 women, Adeline is the most feisty and prickly of the bunch. But what can you expect from a girl who has 8 brothers and sisters and was sent off to school at the age of 12 on a mail coach. She was lucky enough to find life-long friends at school as well as a love and talent for archery. Jasper, the Earl of Ailesbury did not have such a lucky childhood. At the age of I have loved the Lady Archer's Creed series and this 3rd book is no exception. This book is a great addition to the series. Of the 4 women, Adeline is the most feisty and prickly of the bunch. But what can you expect from a girl who has 8 brothers and sisters and was sent off to school at the age of 12 on a mail coach. She was lucky enough to find life-long friends at school as well as a love and talent for archery. Jasper, the Earl of Ailesbury did not have such a lucky childhood. At the age of 12, his parents, some servants and horses were killed in a barn fire. Jasper received burns from his face to his hip when he attempted to try to save them. Unlike Adeline, Jasper did not have any friends to support him and lived his entire life on his estate, hidden away helping his tenants and villagers while they called him the Beast of Faversham. When these 2 meet something happens to both of them, maybe not love at first site but certainly interest. They seem to complement each other and bring out the best in the other. This is an emotional and deeply introspective retelling of the Beauty and the Beast trope. We've met Adeline in the two previous books of this series, and she was pretty difficult to like. She thinks very highly of herself and likes to be in control within her clique, a throwback to the days of battling her eldest brother, I would guess. In this installment, Adeline finds herself in a stranger's home and totally out of her element, but still can't seem to stop herself from doing whatever she ple This is an emotional and deeply introspective retelling of the Beauty and the Beast trope. We've met Adeline in the two previous books of this series, and she was pretty difficult to like. She thinks very highly of herself and likes to be in control within her clique, a throwback to the days of battling her eldest brother, I would guess. In this installment, Adeline finds herself in a stranger's home and totally out of her element, but still can't seem to stop herself from doing whatever she pleases. During some of these challenges to Jasper's authority, she witnesses his goodness and compassion to people who treat him badly and her heart is stirred. I'm still trying to figure out what exactly causes Jasper to become smitten with Adeline in the first place, because I don't see him as so shallow to be instantly wowed by her beauty and figure and overlook her superiority complex and stubborn disregard for his authority in his own home. But, Beauty and the Beast is my favorite trope, so I whistled past that to get to the part where "they looked beyond the surface and saw the good qualities inside each other." Jasper Benedict, Earl of Ailesbury, has been known as the Beast of Faversham since he was scarred in a fire that killed his parents. He does everything he can to make life better for the people of his estate and village, but still fear and shun him. Adeline Price is a quite a beauty, on the outside. She is outspoken, selfish, gossipy, and judgmental. The two of them meet when he rescues her from her broken carriage during a fierce storm. During her short stay at his estate, she begins to like Ja Jasper Benedict, Earl of Ailesbury, has been known as the Beast of Faversham since he was scarred in a fire that killed his parents. He does everything he can to make life better for the people of his estate and village, but still fear and shun him. Adeline Price is a quite a beauty, on the outside. She is outspoken, selfish, gossipy, and judgmental. The two of them meet when he rescues her from her broken carriage during a fierce storm. During her short stay at his estate, she begins to like Jasper and is unhappy with the way he is treated by the people of the village. By the time they return to London, Adeline has begun to think about her own behavior. Is it possible that being with Jasper can help her become a better person? Adeline is the third book in the Archer’s Creed series. Adeline has been a brat from the start. Jasper is the perfect complement to her personality. She and Jasper are beauty and the beast, but just who is the beauty and who is the beast. The characters, with the exception of Jasper, are familiar. The plot of this story is perfect for our hero and heroine. A lovely story and a good read. Adeline Price has her story told in the latest of Christina McKnight’s series “Lady Archer’s Creed). Having been sent away to a finishing school for girls from a young age, Adeline is on her way home when she is caught in a vicious storm. Jasper Benedict, the Earl of Ailesbury, rescues her and takes her back to his home. Unbeknownst to Adeline, Jasper is hiding the scars of a fire that he barely escaped from. After losing his parents and many staff, Jasper has become a recluse and is treated lik Adeline Price has her story told in the latest of Christina McKnight’s series “Lady Archer’s Creed). Having been sent away to a finishing school for girls from a young age, Adeline is on her way home when she is caught in a vicious storm. Jasper Benedict, the Earl of Ailesbury, rescues her and takes her back to his home. Unbeknownst to Adeline, Jasper is hiding the scars of a fire that he barely escaped from. After losing his parents and many staff, Jasper has become a recluse and is treated like a pariah, by the community. He is considered a ‘beast’ and now believes all the cruel taunts, whispered about him. A series of events stops Adeline from returning to London and during this time, she begins to see the admiration that Jasper’s staff feels for him and the level of responsibility that he feels in turn, for all those who work for him. Ms McKnight gradually reveals the complexity of his character and during this time, Adeline also appears to mature. Her respect and love for Jasper are gradual and so heart-warming. This is a sweet novel and an easy read. Everything changed the night his family died in a tragic fire for Jasper Benedict, the Earl of Ailesbury. One story night Jasper rescues a woman when he stumbles upon a damaged carriage carrying Miss Adeline Price. Adeline has been rude, mean spirited and judgmental in other words beautiful on the outside, but not on the inside. Jasper has a wounded soul, he’s the beast with the heart of gold trapped in his scarred body, but when he meets the beautiful Adeline he wants to forget his past and be Everything changed the night his family died in a tragic fire for Jasper Benedict, the Earl of Ailesbury. One story night Jasper rescues a woman when he stumbles upon a damaged carriage carrying Miss Adeline Price. Adeline has been rude, mean spirited and judgmental in other words beautiful on the outside, but not on the inside. Jasper has a wounded soul, he’s the beast with the heart of gold trapped in his scarred body, but when he meets the beautiful Adeline he wants to forget his past and be free and able to love and be loved in return. Jasper begins to see Adeline for who she really is, not the rude mean spirited woman and she glimpses his kindness and goodness as he takes care of his servants and the people in the village. Can the Beast tame the Beauty and change her heart? This is an enchanting story with a lesson for everyone beauty is only skin deep but we need to look deeper to see the real person and their true qualities. I highly recommend this book! I voluntarily read this ARC copy from Net Galley and this is my honest review. *I received a copy from the author in exchange for my honest review. This is my favorite book in this series! They were what each other needed and didn't even know it. I loved seeing both of them change and fight their feelings at times. His servants knew what they were doing and didn't care what he thought. I was afraid in the end what would happen, but loved how different it was. Adeline has always been at odds with people. She is one of my favorites because she speaks her mind even though at ti *I received a copy from the author in exchange for my honest review. Adeline has always been at odds with people. She is one of my favorites because she speaks her mind even though at times it doesn't it comes out harsh. I loved that she started to see her ways of thinking wasn't the best and started to change. BUY BUY BUY BUY BUY! Now...... many will argue the five star rating however.............................It deserves that and more in my own opinion. A fairy tale twist with dashes of human fallacy showing through. I had such a time reading this wonderful romance that it made me stop and think about a few things along the way. A wonderful romance with so many real life actions and reactions of real humans! My heart hurt. Being a fan of the fairy tale, I did not expect to like this story. Was I ev BUY BUY BUY BUY BUY! Holly heck what a book! Well the whole series is wonderful. the beast of haversiom. But this is not beauty and the beast. could tell ever Holly heck what a book! Well the whole series is wonderful. and cannot wait for more.. Finally! Adeline's story! This book tells the story of Jasper Benedict and Adeline Price. Jasper has a tragic past that continues to haunt him even in the present day. Adeline is a feisty and adventurous lady whose carriage breaks down in a storm one fateful night, and that is how they meet. Foul weather and a broken carriage forces her to stay at his residence, and she gets a glimpse of the man. Will she realize that he is a good man? Will she recoil when she finally discovers he is scarred? Re Finally! Adeline's story! This book tells the story of Jasper Benedict and Adeline Price. Jasper has a tragic past that continues to haunt him even in the present day. Adeline is a feisty and adventurous lady whose carriage breaks down in a storm one fateful night, and that is how they meet. Foul weather and a broken carriage forces her to stay at his residence, and she gets a glimpse of the man. Will she realize that he is a good man? Will she recoil when she finally discovers he is scarred? Read this wonderful book to find out. Sign up for Christina's newsletter USA Today Bestselling Author Christina McKnight writes emotional and intricate Regency Romance with strong women and maverick heroes.